The Documentary Film Institute at the University of Florida is interested in getting publicity for its program and the documentaries that the graduate students and the faculty in the program produce. However, this year, a documentary could be made about the Documentary Institute itself. 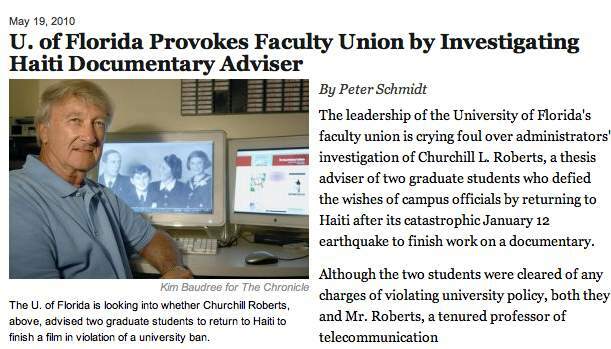 Churchill Roberts and "Bound by Haiti" are the focus of a story in The Chronicle of Higher Education. The latest issue is about one of the four documentaires produced this year — “Bound by Haiti.” The controversy regarding this film was the subject of a story in The Chronicle of Higher Education and on-going coverage in The Gainesville Sun. “My Brother, My Sister” — The story of two brothers and two sitsters who were involved in the civil rights movement in Florida in the 1960s. “Recording a Revolution” — The challenges for hip-hop artists in Northern Nigeria in presenting a music form and social messages that are opposed by the government. “Civil Indigent” — The recent controversy about the number of homeless who can receive free meals at a shelter in Gainesville. “Bound by Haiti” — The story of two men, one from Florida and one from Haiti, who are involved in helping the children of Haiti both before and after the earthquake. The documentary that has created the controversy for the University of Florida is “Bound by Haiti.” The controversy was caused because the two graduate students who produced the film returned to Haiti after the earthquake to complete filming. They had been in Haiti at the time of the earthquake and evacuated. But they wanted to return to complete telling the story their documentary focused on — the two men who were helping children, one by helping build a school in a remote village and the other by distributing pills to help children overcome intestinal parasites. Before the two graduate students, Jon Bougher and Roman Safiullin, could return to Haiti after the earthquake, UF administration established a policy that UF students and faculty could not go to Haiti on UF funding due to the potential dangers. So the issue first was whether they had made the trip with UF funding. No, as Dr. Mickie Edwardson, a distinguished retired faculty member from the College of Journalism and Communications, financed their trip. Then the controversy focused on Dr. Churchill Roberts, the co-director of the Documentary Institute and the thesis director for Bougher and Safiullin. UF investigated whether Roberts encouraged them to make the trip or assisted them in making the trip to Haiti after the earthquake. He was interviewed by UF Human Resources and had to submit any e-mail sent from his university account to either of the two students. The HR investigation results, announced on May 19, were that Roberts had not violated UF policy. So many issues have been involved in the controversy about “Bound by Haiti” — the First Amendment rights of the students, the legality of the university’s travel ban, and whether UF’s challenging Dr. Roberts was an infringement of his academic freedom. I’m glad Mickie Edwardson was able to attend the screening of “Bound by Haiti” and be recognized for her support of the project. She passed away recently, just two weeks after the screening. One of her research interests was James Fly, the former Federal Communications Commission chairman and director of the American Civil Liberties Union. In addition to academic publishing she did on Fly, she established an endowed scholarship in his name.She was active in the League of Women Voters and the Gainesville chapter of the United Nations Association. She embraced controversy and tried to use organizational structure and individual initiatives to promote constructive change. “Bound by Haiti” is a worthy tribute to her.